Little One is an account of the relationship between two adopted siblings. One, Aaron – played by Joe Cobden – is a fairly well-adjusted, if neglected, young man, while the other, Claire – played by Michelle Monteith – is a deeply traumatized and disturbed little girl. 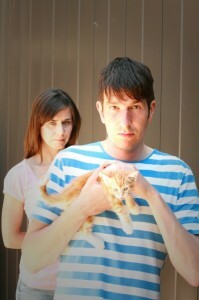 It is playing at the Theatre Passe Muraille for the duration of SummerWorks. Aaron tells his story directly to the audience. His character may take a little bit of warming up to – for instance, my boyfriend didn’t like him until he began interacting with his sister. Joe Cobden’s performance is good and he moves fluently between his adult and child personas. Michelle Monteith as Claire is perfect, playing a believably creepy and disturbing child. In between scenes of the brother-sister relationship, Claire tells the audience a story (supposedly a horror, given the flashlight she holds under her face) about her neighbours, a man and his mail-order bride. I am still uncertain as to what point this story served, however, given Claire’s mental state it might be intentionally unclear. The mood is set to the sounds of a toy piano, played live by 13-year-old Kaylie Lau. It gives the play a child-like quality, as well as adding another level of creepiness to the show. A warning: Little One is not for children, nor for those easily disturbed, as there are certain sexual situations and implied animal cruelty that some may find unnerving. Taking that into consideration, however, I enjoyed the show very much and would recommend catching it before the end of the festival. – Playing Aug. 9 at 5:30pm, Aug. 11 at 10:30pm, Aug. 13 at 8pm, and Aug. 14 at 3pm. Photo of Michelle Monteith and Joe Cobden by Natasha Mytnowych.